The current trend of good cop, bad cop documentaries continues with Crime + Punishment, a film released on Hulu, focused on modern corruption in the New York City Police Department and the dozen current and former officers pushing back on debunked "broken windows" policing tactics, specifically regarding arrest quotas. Despite being outlawed statewide as of 2010, the quotas have remained a scourge in some neighborhoods, which led to a class action lawsuit filed a few years ago, the cop plaintiffs nicknamed the "NYPD12." 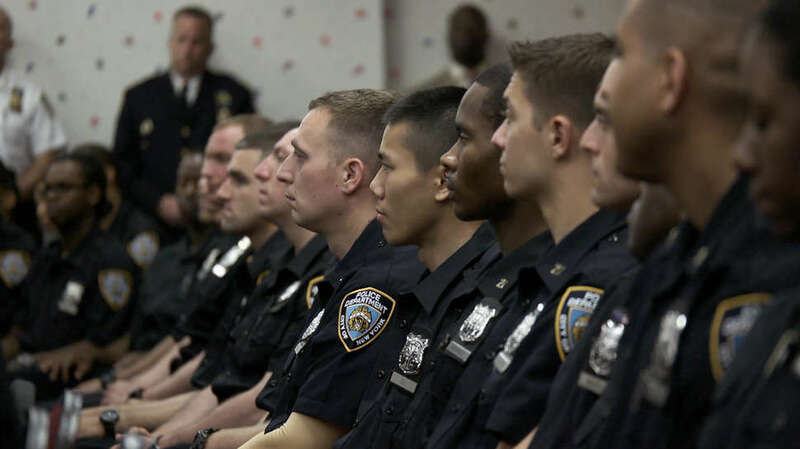 With more than 30,000 members of the NYPD, the battle against systemic failures might seem insurmountable. But the immorality and substantial negative effects of such tactics, including hurting community relations, is what motivates them. Because cops will invent charges in order to fill quotas, many cases are dismissed. For individuals with multiple arrests -- regardless of them all being dismissals -- they eventually become easy scapegoats for actual convictions, even if they’re innocent. Through the film, we see the members of the NYPD12, all people of color, face unfair retaliation for declining to target minority communities and pull bodies through the courts solely for the benefit of the department’s budget. They're passed up for promotions, given unwanted and inconvenient shifts or assignments, and graded poorly on evaluations. The film is not only an accomplishment of access, but director Stephen Maing (High Tech, Low Life) subtly becomes a part of the story by immersing himself in it. He films conversations between one of the main NYPD12 subjects, Edwin Raymond, and one of his supervisor, the audio secretly recorded to support the lawsuit. Maxing also provides hidden watch and pen cameras for his subjects to collect some of their evidence. The ethics behind this involvement may be seen by some viewers as grey, but the purpose and outcome should be accepted as worthy. To the filmmaker, as with his subjects, the cause outweighs the risk of scrutiny. Because it’s a massive systemic problem, the aggressive mentality of the department takes time to dismantle, but this and the racial profiling that goes hand-in-hand with forced arrests must be prodded and checked constantly. Through activism, legal action, documentary reporting, and independent investigation, Crime + Punishment shows the process and the ups and downs of some of the NYPD12 whistleblowers, and it also follows the work of former cop-turned-private detective Manuel Gomez -- the standout character of the film -- as he helps to keep an innocent young man out of prison. The film features both individual and collective triumphs, but this is an ongoing, evolving story, one that will last for a while. Since the making of this film, the NYPD has continued to be accused of breaking the law by encouraging a minimum of collars and retaliating against clean cops, but the police commissioner recently implemented mandatory "no quota" training for all officers of all ranks. That is a step in the right direction, one that's a result of the pressure the NYPD12’s lawsuit and subsequent media attention -- including the success of the film, which was honored at Sundance -- has placed on this fight. In covering the story so intimately, Crime + Punishment shares the nerve-racking personal experiences of people doing what’s right. The result is a rare issue film that is constructive and inspiring.